Let’s say you’re in the nursery business and can crossbreed popular succulents so their offspring combine their parents’ most desirable traits. What would you aim for? That’s what I found out on a recent visit to Altman Plants, the largest grower of succulents in the US. I was there to photograph Altman’s spring succulent introductions—new beauties now available (or soon to be) through Monrovia and other distributors, and also via Altman’s online mail-order nursery. The ones shown here were created by Altman staff hybridizer Renee O’Connell, who specializes in echeverias and other nonspiny varieties. Renee’s own descriptions, below, are in green. Echeveria ‘Camaleon’: The intent of this cross was to create a dark echeveria with these odd colors, but what’s interesting is that ‘Camaleon’ (Spanish for chameleon) has what I call an “ephemeral variegation.” For several months the new growth is often yellow, lime green, and shades of blue green, sometimes blushed pink in high light, before reverting to its unusual dark hues. Echeveria ‘Galaxy Blue’: This cross was done to create a undulate, offsetting echeveria. ‘Galaxy Blue’ is versatile in that it looks good in a 2.5” pot, has already begun to offset at 3-1/2 inches in size, and is equally attractive in a 2-gallon pot. ‘Platinum’ is an attractive plant that has proven landscape worthy in temperate climates, but for me, its unusual, very delicately tinted flower is the pièce de résistance. Cotyledon ‘Chocolate Fingers’: The intent of the cross that resulted in ‘Chocolate Fingers’ was to create a variable color for Cotyledon; something different than the shades of white or gray that are so prevalent. Cotyledon ‘Mint Truffles’: Unlike many other cotyledons, ‘Mint Truffles’ does not grow upward to become lanky, but spreads laterally in the landscape. The mint green leaves, margined with red, create an attractive accent for other plants in the landscape. 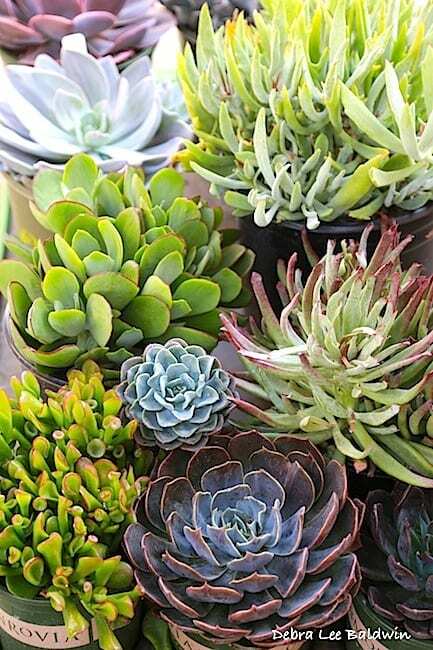 What about Echeveria galaxy green succulents, what is the height and width of mature plant. I’m not familiar with that cultivar, sorry.